A days after his response, my 11th grade class was reading The New Jim Crow, when one of my students blurted “Can we write down a question right now? My question is what are the solutions to this? How do we solve this?” He them schooled us all and described how the government created this problem of the War on Drugs to lead to a conspiracy driven solution of mass incarceration of black and brown folks. Our students have every ability to think critically and push themselves as any other school in any other zipcode. Our inner city school system have been a historical culprit of perpetuating detrimental and genocidal practices that target our youth of color. In this essay, I recognize that we cannot treat our kids like machines or a number; otherwise, we are no different from the streets. We must expect our kids to fulfill their potentials and highest dreams, propelling them into their future with the faith of their community. Where we as a nation have greatly failed our students is labeling them is incompetent and criminals. Our youth are raised by the streets, but they are still young and brains still malleable enough to make changes in their behaviors. Labels are not only bad manifestation, but can greatly impact student self-perceptions and outcomes. Throughout decades, our schools have demanded the position of influencers and role models in our youth’s lives. Yet, we are not the only ones calling for them--we are constantly in competition with the culture of the streets. The streets constitute an institution in the same way that the church, school, and family are conceived as institutions. They all have a set of values and norms to govern and enforce their existence...and it is on the streets where the Black child receives his basic orientations in life (Kunjufu 17). Ghetcolony is the very insitution that is pulling our youth, particularly boys of color, into the streets and out of the classroom. By labeling the streets as an insitution, Kunjufu opens up the conversation of how to impede negative influences on our youth from their environment--nature vs. nurture. As responsible citizens and human beings, we must acknowledge that the battle to get kids to engage does not begin the moment our students step into our classrooms, but the moment they were born into their zipcode. 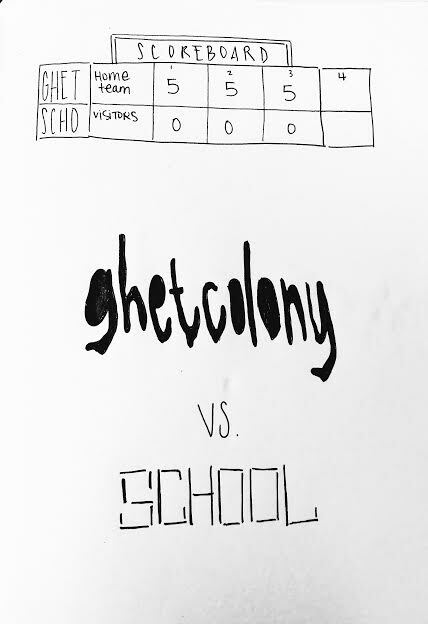 Getcolony is a culture that grew from govermental policies and strategies to keep people of color zoned into a segregated community that lacks access to social mobility in mainstream America. It a byproduct of sanctioned poverty; not reflective of the indigenous and powerful spirit of our predecessors that have a historical narrative of overcoming. Neighborhoods are now warzones, where students must choose a side--red or blue, or be at risk of becoming bullied. School has become just another playground to practice the culture of the streets, where being smart is a NERD and feminine thing. Schools must acknowledge their competition and become a safe space for our students to unlearn the operations of the machine an be human. This is the only way we will win their hearts. J.Cole raps about the lack of role models in our hoods. Kunjufu further affirms that, “and the hustlers, pimp,s street men and other social outcasts who serve as models for the young." Students pick and choose who they want to aspire to be, their gurus. It is up to our youth to designate who their adult role model figures will be: teachers, coaches, parents, drug dealers? School need to consider what institutions are influencing the development of our young ones. We need to acknowledge and address the streets. To gain our youth’s respect we must show them something new; something they are not used to from the street and some schools. It is always a blessing to have alumni superstars visit their schools to show them they made it, but our community must also reel in a diverse set of young millennials who are living their best lives because these are young adults who are relatable and financially independent. Currently, the school as a system manages our students the same way the streets and prisons handle them--like a number. However, we are at a loss because the streets provide more immediate and quick fixes to their lives, affirming our young with “brotherhood” and financial and social capital. So what makes us different from the streets? Our youth have many options in making money, THAT DO NOT INVOLVE EDUCATION. We need to show something different and shift the mental perspective of our youth because not everything is about making money. Education in its more original form is about cultivating a linguistic that expresses your personhood and purpose. It’s about students finding meaning in life. We want our youth to feel human, to feel inspired, to enjoy life. Career paths are self-exploration journeys and self discovery. Higher education and college are about shifting perspectives and finding voice, which is probably why so many protests spark at this age. The illusion that materialism is all gain is a trap for many of our youth. Schools must treat our kids not as a number in the banking system; we can no longer expedite our students. Their presence in school is more than an attendance number that accrues our financial gains. Schools are safety nets from the streets. We call our young by their names, not criminals, not incompetent. Human connection: it will be our greatest defense. For our students to choose their greatest self before the streets, we must call them by their names first.